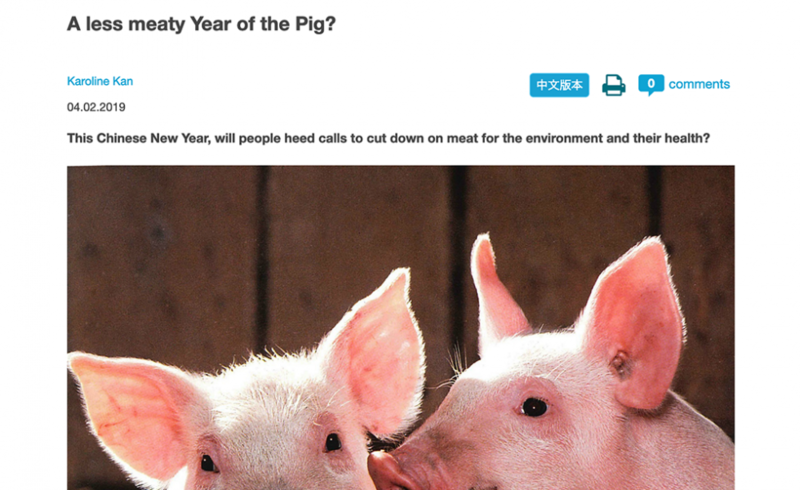 Jian Yi, our partner and founder of the Beijing-based Good Food Fund, was quoted in an article in China Dialogue called, “A less meaty Year of the Pig?” that featured GFF’s Chinese (lunar) new year plant-forward initiative. The article describes the tradition in China to eat more meat when celebrating holidays, like the lunar new year. However, GFF and others are working to create a new tradition, one that focuses on plant-based alternatives to meat-heavy meals. The lunar new year Food Forward Forum initiative is linking good health, environmental sustainability, and concern for non-human animals through a campus-based learning and exchange tour. Jian Yi believes that people in China are becoming more concerned about healthy eating and says, “we need a food revolution.” You can read the full article in English here and in Chinese here.